A lot of posts that I've made about the whiskey and whisky at Lock & Key has featured reviews of individual bottles of booze or an insight into the cocktail menu at the bar. 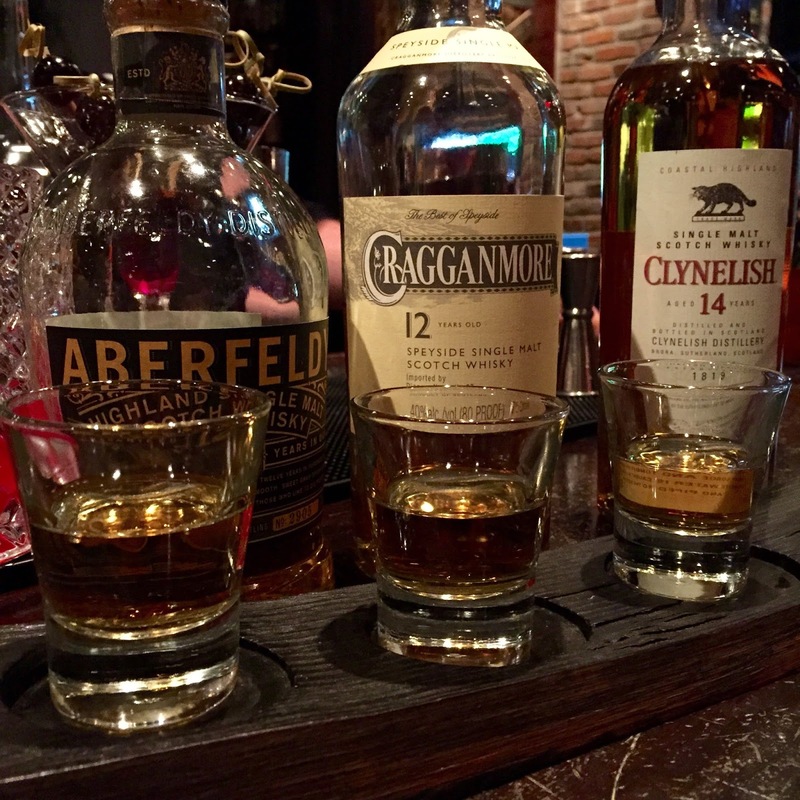 This week, however, we'll examine a whiskey flight at Lock & Key, and why they present a terrific way to consume the water of life. The Touch of Smoke and Fruit Flight ($23) provides a tasting of three single malt Scotches that are nicely balanced but complex enough for any Scotch drinker to appreciate. Typically the Dalwhinnie 15 is included in this flight, but since Lock & Key was out of stock on my most recent visit, they replaced it with the Aberfeldy 12 Highland Single Malt. I didn't complain. The Aberfeldy had a nice peat flavor without overwhelming smoke. A hint of mint and splash of pear were also there. The Cragganmore 12 from Speyside presented a lovely balance of fruit and smoke, as advertised. This is a nice sipping Scotch to be sure. The Clynelish 14 from coastal Highlands may have been my favorite of the bunch. It carried the most smoke upfront and then finished a little more fruity. All in all this flight impressed, and getting three pours for $23 is a great way to enjoy different flavors while at a whiskey bar with the kind of selection that Lock & Key has. I highly recommend it!